In this latest Blog, Not for Profit Fulbright Scholar, Dr Tessa Boyd-Caine writes of her encounter with Elizabeth Warren - US Senator for Massachusetts, advocate against poverty and inequality, and darling of progressives across America and internationally. In this latest Blog, Not for Profit Fulbright Scholar, Dr Tessa Boyd-Caine writes of her encounter with Elizabeth Warren – US Senator for Massachusetts, advocate against poverty and inequality, and darling of progressives across America and internationally. I have just completed a US Study Tour organised by the Center for Australian Progress, meeting with hundreds of Not for Profits and funders across San Francisco, Washington DC, Detroit and New York City. The Tour included the Netroots Nation 2014 conference (#NN14). This was so far off my radar, I didn’t even know how to say it, initially calling it ‘ne-troots’, like an unknown town in the deep South. But #NN14 brought with it some of the most stellar performances I have seen on my US adventure. It’s also how I met Elizabeth Warren. 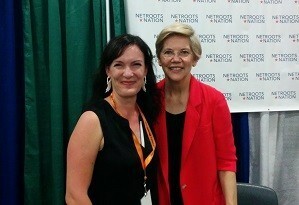 Tessa Boyd-Caine with Senator Elizabeth Warren. Netroots Nation is the root of net-based campaigning and organising across progressive America. It aims to amplify progressive voices by providing an online and in-person campus for exchanging ideas and learning how to be more effective in using technology to influence the public debate. My first session was the opening keynote by Vice President Joe Biden, replete with his trademark candour and willingness to talk off-prompt. The session also brought us close up to one of the most significant campaigns running in the US at the moment, as a group of participants interrupted the VP chanting ‘stop deporting our families’. A second group stood by in silent solidarity with fists raised. The rest of the audience looked on, mostly in silence; some unclear what the protest was about, others unsure how to react, surrounded as we were by an extensive Secret Service detail. In the end Biden acknowledged the scattered applause as the protesters were escorted out and encouraged the rest of the crowd by saying, ‘you should cheer’. It was a gracious and respectful response from the VP. It also revealed how easy it is to be cowed into silence, even in an avowedly progressive environment. The days’ highlight came that evening, as Reverend William Barber of North Carolina’s Moral Mondays movement outlined the 8-year process to build a highly organised and engaged movement of cross-interest, cross-generational, bi-partisan participation in democracy; first in North Carolina and then in other southern states. As mesmerising as his gospel-style preaching was, it was Reverend Barber’s unscripted description of the work engaging communities that inspired, delighted and entertained the crowd for over an hour. Things only got better on day two as we packed back into the large convention center to hear a keynote by Elizabeth Warren: Senator for Massachusetts, advocate against poverty and inequality, and darling of progressives across America and internationally. Warren’s address to a standing-room-only crowd touched on her core themes of raising the minimum wage and ensuring equal pay, access to education, entitlements to social security and health care, and the important role played by immigration socially and economically. It also generated a huge amount of media attention across the US, Warren’s popularity and clarity of message inspiring engagement with issues that often fail to cut through the mainstream otherwise. 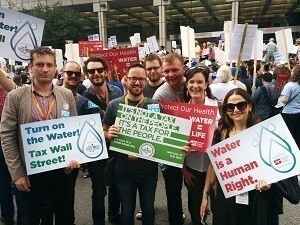 Australian Progress US Study Tour members joined a protest against shutting off water to residents in the Netroots Nation host city of Detroit. Rest assured, when I met her that afternoon I invited her to Australia. I’m still waiting to hear back from her people! On the final day I made the most of the breakouts to get a good dose of feminism. Running for the third year in a row, the #AskaSista panel had ‘black women muse on politics, policy, pop culture and scholarship’. The panel started with the economic context, noting how everything from marketing to social media have been re-engineered to target black women as consumers, yet are failing to employ or consult with this same group. Another session, ‘Daring to internet while female’, explored the misogyny with which people attack female activists and campaigners online. Freedom of expression bares no relation to the loathsome, hateful tactics of anonymous trollers online but, shocking as some of the examples were, the humour, intelligence and creativity with which women have responded was awesome to behold. Ironically, I experienced my first trolling that afternoon – I put the panel’s lessons to good use. The Fulbright Professional Scholarship in non-profit leadership is sponsored by the Origin Foundation and supported by the Australian Scholarships Foundation. Applications for the next Fulbright Scholarship close 1 August 2014.